Brigadier Mohammad Usman was the highest ranking officer of the Indian Army to lay down his life for the country. He was killed in the Indo-Pakistani War of 1947. As a Muslim, he became a symbol of India's "inclusive secularism". At the time of the partition of India, he with many other Muslim officers refused to move to the Pakistan Army and continued to serve with the Indian Army. He was killed in July 1948 while fighting Pakistani soldiers and militia in Jammu and Kashmir. He was later awarded the Maha Vir Chakra. In this article, we shall have a brief look on his acts of bravery in the war. Mohammad Usman was born in Bibipur, Azamgarh district on July 15, 1912 to Jamilun Bibi and Mohammad Faqooq Khunambir. At the age of 12, he had jumped into a well to rescue a drowning child. He made up his mind to join the Army as an officer despite the fact that Indians got limited opportunities in this field and there was very tough competition. He succeeded in gaining admission to the prestigious Royal Military Academy Sandhurst, UK (RMAS). He entered RMAS in 1932. He was a teetotaller and did not marry throughout his life. He used to donate a large part of his salary to support poor children and pay for their education. He is buried in a grave near the Jamia Millia Islamia campus in New Delhi. 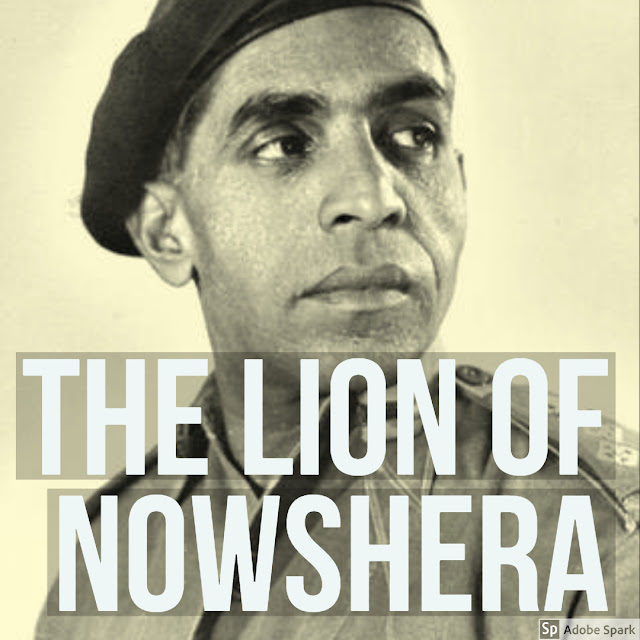 A 50 minute film named Nowshera Ka Sher, directed by Upender Sood and Ranjan Kumar Singh has been made which depicts his life from his college days to his death. His birth centenary was celebrated in 2012 by the Indian Army at Jhajjar, Haryana. A Paramotor Expedition was also organized by Gorkha Training Centre in his memory. he was killed in the Indo-Pak War of 1947. Indian Prime Minister Jawaharlal Nehru and his Cabinet colleagues attended the funeral of Usman — “the highest ranking military commander till date” to lay down his life in the battlefield. He was given a state funeral of a martyr. he was awarded the Maha Vir Chakra posthumously. After completing his training from RMAS, he was commissioned as a Second Lieutenant and appointed to the Unattached List for the Indian Army on 1 February 1934. After that he was attached to the 1st battalion of the Cameronians on 12 March 1934 for a year. After the end of his year with the Cameronians, on the 19 March 1935, he was appointed to the Indian Army and posted to the 5th battalion of the 10th Baluch Regiment (5/10 Baluch). Later in the year he saw active service on the North-West Frontier of India during the Mohmand campaign of 1935. He qualified as a 1st class interpreter in Urdu in November 1935. He was promoted to the rank of Lieutenant on 30 April 1936 and Captain on 31 August 1941. By April 1944, he was a temporary Major. He served in Burma campaign of the WW2 and was mentioned in dispatches as a temporary Major in the London Gazette 27 September 1945. He commanded the 14th battalion of the 10th Baluch Regiment (14/10 Baluch) from April 1945 to April 1946. During the partition of India, Usman, he was under intense pressure from Pakistan to opt for the Pakistan Army because he was a muslim and also an officer of the Baluch regiment. He was promised a future position as the Pakistan Army Chief, but he still refused to join the Pakistani Army. The Baluch Regiment was allotted to Pakistan and Usman was transferred to the Dogra Regiment of the Indian Army. In 1947 Pakistan sent tribal irregulars into the princely state of Jammu and Kashmir in an attempt to capture it and accede it to Pakistan. Usman was commanding the 77th Parachute Brigade and he was sent to command the 50th Parachute Brigade, which was deployed at Jhangar in December 1947. Jhangar was strategically important for India because it was located at the junction of roads coming from Mirpur and Kotli. On 25 December 1947, Pakistani forces captured Jhangar and Indian forces were withdrawn from there. On that day Usman took a vow that he would not sleep on a bed till he recaptured Jhangar. He captured it 3 months later, but at the cost of his own life. In January–February 1948 Usman repulsed fierce attacks on Nowshera and Jhangar, both highly strategic locations in Jammu and Kashmir. During the defence of Nowshera against overwhelming odds and numbers, Indian forces inflicted around 2000 casualties on the Pakistanis while Indian forces suffered only 33 dead and 102 wounded. This defence earned him the nickname Lion of Nowshera. Pakistani forces then announced a sum of Rs 50,000 as a prize for his head. He did not care about any praise or congratulations and continued to sleep on a mat laid on the floor as he had vowed that he would not sleep on a bed till he recaptured Jhangar. After a series of operations by the Indian Army in the last week of February 1948, the enemy was eventually driven from the area, and Jhangar was recaptured. Pakistan brought its regular forces to Jhangar again in May 1948. Jhangar was once again subjected to heavy artillery bombardment, and many determined attacks were launched on Jhangar by the Pakistan Army. However, Usman made sure thaall their attempts to recapture it were failed. Usman was killed on July 3, 1948, by an enemy 25-pounder shell while defending Jhangar. He was 12 days short of his 36th birthday. His last words were "I am dying but let not the territory we were fighting for fall for the enemy”. For his inspiring leadership and great courage, he was awarded the Maha Vir Chakra posthumously.